The Illuminate LED Task Light has five levels of brightness and three color modes, along with a built-in blue nightlight in the base. 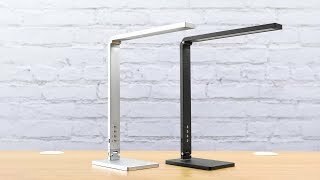 How many light settings are on this task light? The Illuminate LED Task Light boasts three different light modes (Warm, Cool, and Natural) with five brightness levels for each, which totals up to fifteen shades of light from which to choose to help you task. You bet! This super functional task light comes with a handy USB port on the base, so you can power and charge your most-used devices right on your desktop and within easy reach. Can I turn off the nightlight on the base? Yes! Simply press and hold the power button to turn the nightlight feature on or off. The Illuminate LED Task Light is available in your choice of black or silver. The sleek design of the Illuminate is easy on the eyes, while simultaneously functioning to help ease eye strain felt from staring at a computer all day.